Why Choose a Career in Inside Sales? People choose a sales career for many reasons. From unlimited income to autonomy to generous flexibility, careers in sales have a lot to offer motivated workers. If you are interested in pursuing a sales career, weigh the pros and cons, including total compensation and benefits, of choosing a career in inside sales. Spending the majority of your workday on the phone can be draining. Employers know this and recognize that they need to provide a positive work atmosphere to keep the moral high of their inside sales force. 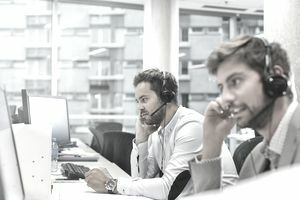 Many inside sales reps work in environments with high-energy morning meetings, frequent "work breaks," during which contests are announced, top performers are recognized, and quick tips and tricks are shared. Even inside reps who work from home or in a remote office can expect to experience a dynamic environment. While they may not get the full, positive effects that those who work in a call center or office environment might, reps working remote often report that their work culture is positive and energetic. Most sales positions offer an opportunity to earn a substantial income because your income largely depends on the number of products or services you sell. Other factors play a role also, like the market to which you sell, the company for which you work, and of course, your performance. Of these factors, the only one that you have complete control over is how well you perform on a daily basis. Those who focus on excellence are often rewarded with bonuses, large commission checks, and opportunities to win prizes and awards. Contests that focus on specific results are common for inside sales jobs, with many companies holding weekly or even daily contests. While some job seekers believe that outside sales professionals earn more income than inside reps, the truth is that both positions pay roughly the same for top performers, though inside sales reps make a larger percentage of their yearly income from bonus incentives like contests, trips, and other awards. Being able to work from anywhere in the world is not something that all in the inside sales industry can enjoy, but many reps can and count that as an appealing factor in their career choice. Imagine being able to work from home a few months a year, a cabin on the beach during the summer months, and even from a resort in Costa Rica a few weeks a year. So long as you have access to reliable phone and internet access and are authorized to work in the U.S., many employers don't care where their employees are based. In fact, employers understand that the higher the morale of their employees, the better and more consistent the results. It takes strong discipline and organizational skills to work remotely, but for those with the temperament, being able to work from wherever they want can be an enormous benefit. So long as your employer is more focused on results than on seeing your face every day, being able to work from anywhere can be a fantastic benefit of choosing an inside sales career.